Earthen Stewards | . :Rocky Hollow Gardens:. We have come a long way since I’ve last posted on this blog. Buckle up, cuz we’ve got lots of updating to do! We breed New Zealand Whites, Californians and have mixes of the two, which is producing all kinds of colors. We get black and white spotted coats, red, & brown. 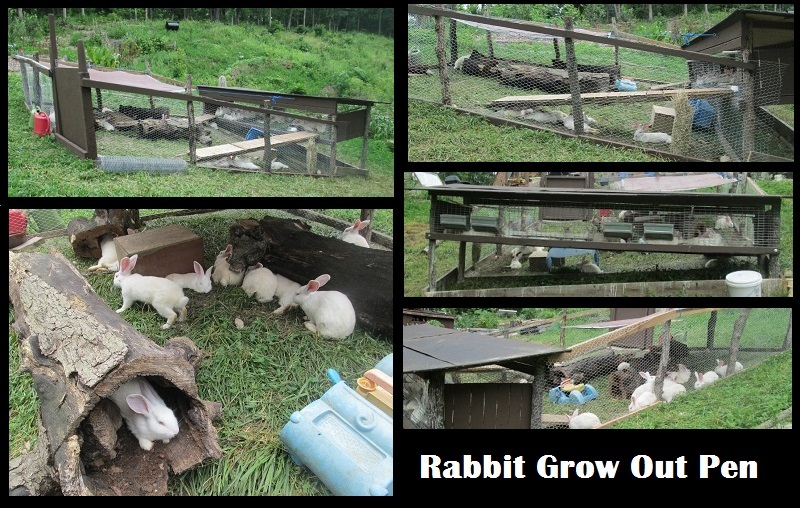 These rabbits grow fast, are very healthy, and are loving our new rabbit set up. 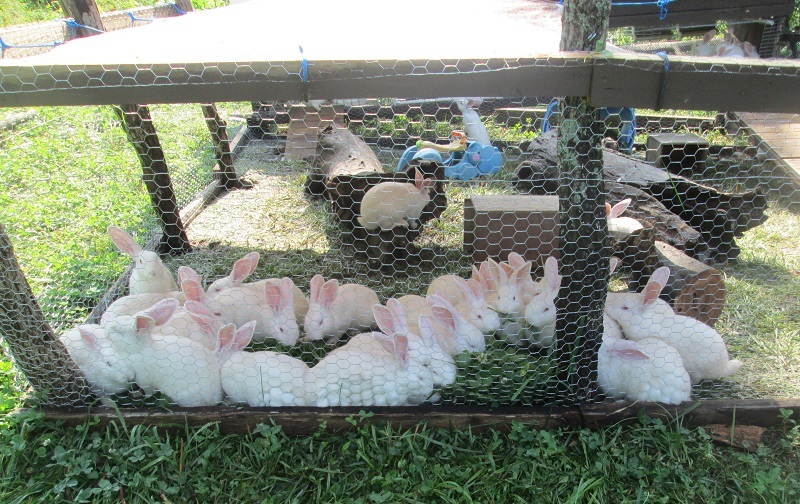 As you see in the pictures above, our meat rabbit breeders are all in colonies now. These ones are nestled into our beloved orchard. We researched a lot of ways to build colonies, and came up with our own design that fits these slopes of ours. So far we have 6 mini-colonies, that house 3 does each (well, 4 of the colonies do, one colony is a big bigger and houses 4 does and one is smaller and only houses 2) – then we built ‘buck boxes’ to the side of two of our colonies (#3 & 5) so the bucks can socialize with the does, but we can still control breeding. We made them out of these old pallet boxes that we salvaged from our local recycyle guy’s free pallet pile. In the future we are going to design this same style colony but use big tractor tires, or cob instead of pallet boxes. In a few years we will have to replace the boxes, as they will break down. The rabbits are so much happier this way. 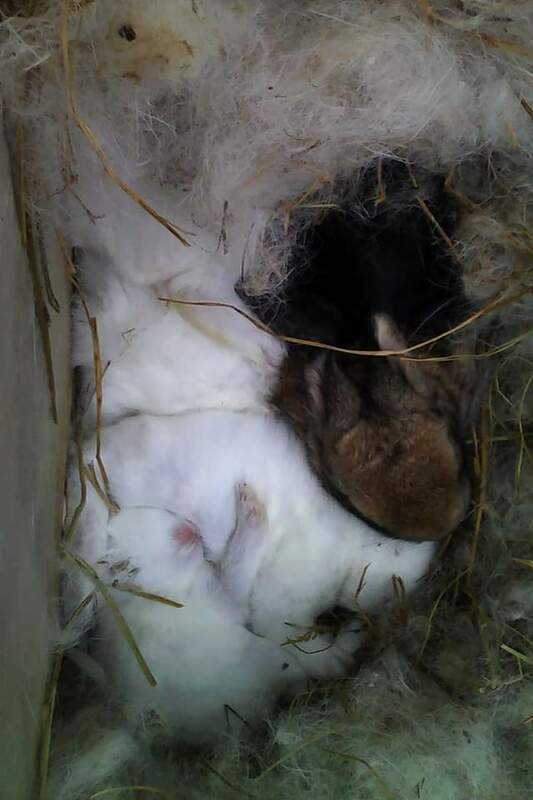 The does are so cute, they cuddle each other, groom each other, and even nurse each others babies. They seem so much happier being with other does, and also being able to be on the ground. Many of the books that we’ve read about rabbit raising warns against letting your rabbits touch the ground (due to diseases) but we have found this to be a myth. Our rabbits are far healthier now than they ever were in cages. We’ve gotten very good at recordkeeping with our breeding schedule, and breed a colony every two weeks. This way we will always have rabbits of varying ages for sale, and plenty of rabbits to grow out for our freezer. This winter the first few of our colony breedings failed (due to being overfed, had to take that chore back from the boys) – but our 4th & 5th colonies have 2 nice litters in it, and the 6th is due any day. So by this summer we will be abundant in rabbits. We raise Mini Rex, Lionhead, Holland Lop and cute mutt mixes for pets to be loved and spoiled. We keep them in the original rabbitry we built. 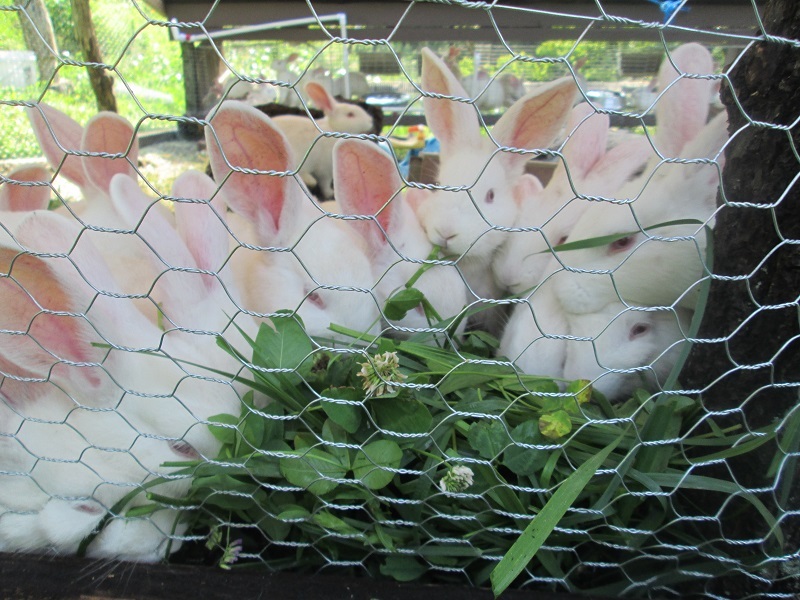 We thought of building colonies for them too, but since most people we sell rabbits to, keep them in cages, we didn’t want the rabbits being used to colony-life and having to go back to cages as this would cause more stress than needed. Our Rabbitry, where we used to keep all our meat rabbits in cages has totally changed too. We pulled down all of the cages we had suspended in a shelter by wire. Then rehung half the cages using metal pipes that make the cages way more stable and easier to keep clean. This is where we keep our herd of pet rabbits. The rest of the space where cages used to hang has been transformed into barn space, where we store feed, supplies and cages. We have 3 big grow out pens that we call “Rabbitats”, when our colony babies reach 6-8 weeks old we wean them from mama and put them in the one of the rabbitat pens. Each pen is about 12×12′, and the attaches cages are 4’x12′. We put between 10 and 15 weaner rabbits in here to grow out to 12 weeks (sometimes longer) until they reach a good harvesting age/weight. At night we have to herd them into the cages and lock the doors to protect them from nighttime predators. So far we have lost zero rabbits to predators in our Rabbitat pens. The weaners love these pens, they have so much room to run, play, dig and hid in big hollow logs that we put in there for them. Every time we harvest from this system we are always amazed at the size of the carcass and the vibrant health of their innards. Don’t believe the books that say keep your meat rabbits off the ground. Done right, your rabbits can be so healthy and happy raised on the earth and out of a cage. This year has been an exciting growing season for us, since switching from hugelkultur mounded rows, laid out on contour, to tire terraces still laid out on contour, and still using hugelkultur principles within the tires, our usable garden space has more than doubled! AND, we aren’t suffering the loss of our precious soil anymore, the soil stays put! The soil in the tires is mostly rabbit manure and composted chicken manure, on top of old rotting logs and brush. In 2013 we built a big garden bed, that we call ‘the E bed’, this year it is showing amazing fertility and soil maturity. The difference in the plants health between the new tire beds and the E bed is quite obvious. I love how each year our garden beds get better and better! 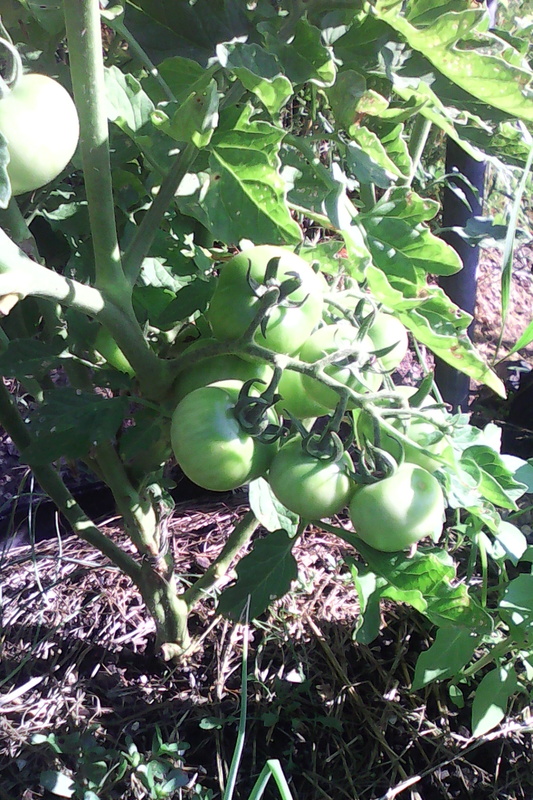 Above is a picture of tomatoes growing in our new tire beds. Not too shabby. 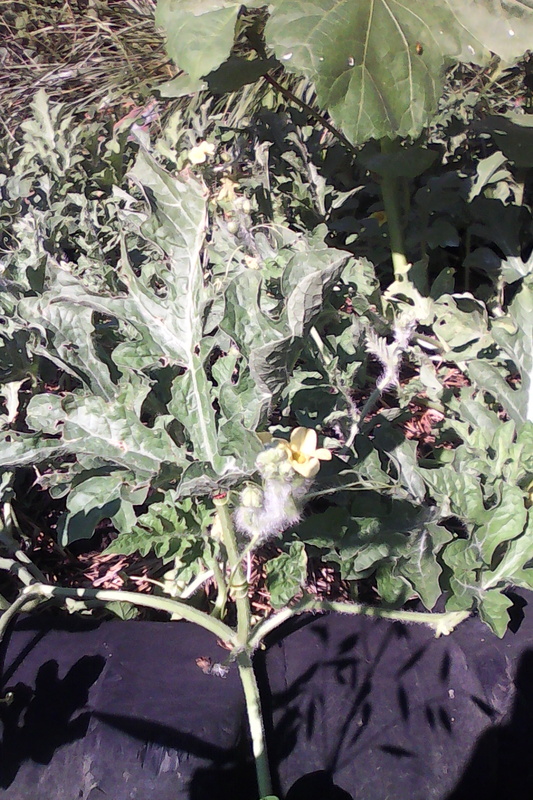 Here is our watermelon patch, growing very well in a big tractor tire bed we built earlier this year. 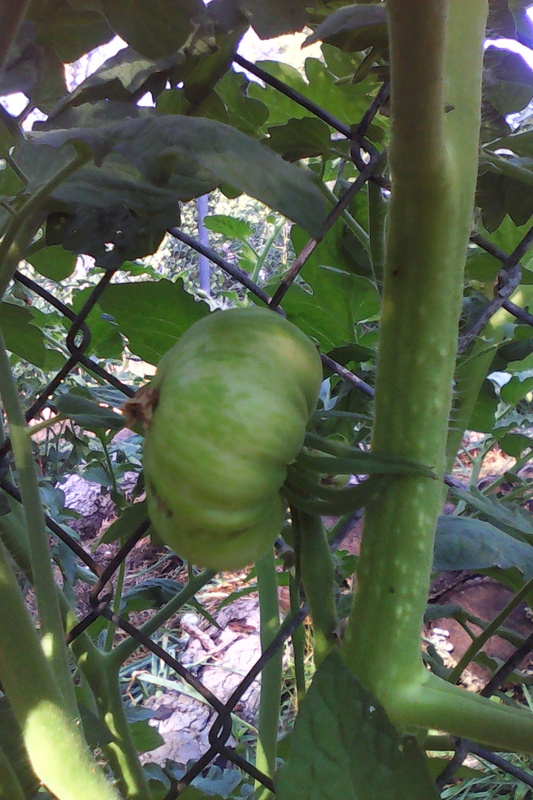 Here is a shot of a tomato plant growing in our mature E bed. These tomato plants are doing stellar! I am amazed! We put our 2 wethers (Dos & Basil) and our new buck (Warrior) in the new pen we built out on the hillside. This pen was built out of recycled materials, fence we salvaged from old dog kennels that confined German Shepherds. We may have spent a few dollars in screws and wire. The rest was what we had on hand. I had heard of goat rental services to clear brush, and now see why someone would rent a bunch of goats to clear a hillside. Wow, these boys have seriously impressed me with their skills. And this is what it looked like the day before we put them in there. So yeah, they are very good at their job and we really want to give them more of the hillside to nibble on. We are welcoming any fence donations to expand their forage area. We would love woven wire for cattle, at least 4′ tall, with this tougher fencing we could even run the pig out in these paddocks from time to time. If you have some fencing you’d like to get rid of and are local to Versailles, we could come take it down and haul it away if you have unwanted fencing. Also we have a paypal you can donate to if you want to help, but don’t have any unwanted fencing, payable to paypal@earthenstewards.com, Thanks! We used 45 free pallets to build the walls of the barn and stall. We used free 4”x12”s for the floor, and big free 8×8’s for the posts to keep the floor up off the ground, free plywood as siding and free metal for the roof. So including concrete for setting the posts, screws, nails, lag bolts, paint, hinges and latches, we are into this thing less than $100. Oh yeah! I’m amazed at what we can build for almost nothing, and this barn will last many years. So now for the photos of the project, from start to where we are now. Day 1 – Setting the posts for the floor. 2016-03-06 – we put up the framing… this was SO HARD, as these timbers were very heavy, awkward and hard to get nails or screws through. Day 3 – 2016-03-10 – We ran out of nails before we could get all of them done, so here we are, nailing some more. Day 4 – 2016-03-11 – Pallet prep day… ugh, this was tedious, and hurt Tim’s back, but he got it done! More than 40 pallets, made uniform for the walls. Day 5 – 2016-03-13 – Making corners with the Pallets, and starting the walls. Day 6 – 2016-03-16 – More wall building, and framing in the doors. Day 7 – 2016-03-17 – Finishing building the walls, and put up the stall. Scabs – this is how we attached the bottom level of wall pallets to the upper layers. Day 8 – 2016-03-19 – Started putting up the pen. Day 9 – 2016-03-20 – Framing the roof. So we began to frame the roof, then once our friend/neighbor dropped off the super thick metal, we decided to take the rafters down, put a center post and beam in and just put the metal up on that. So yes, this framing was taken down. Day 10 – 2016-03-22 – Insulating the walls where the stall is, to keep goat kids draft free, and then siding! Day 11 – 2016-03-23 – Roof on, siding up, stall functional. My view out of that big picture window, so nice! Cozy stall, ready to accomodate our girl! So we have a little ways to go yet. So I’ll update the post as we go. Thanks for reading, and looking. What a year 2015 has been. 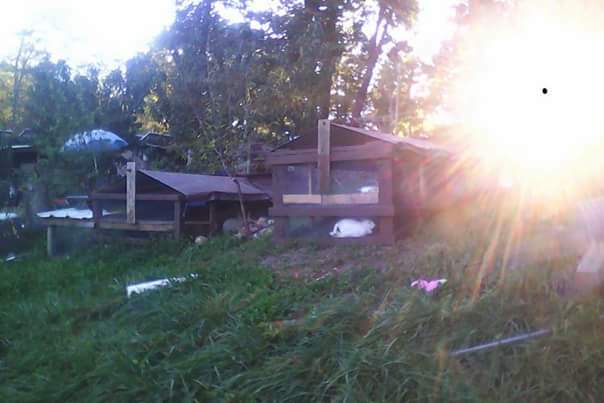 We’ve come a long way, expanded our rabbitry by a lot, added goats, a whole mess of chickens, expanded our muscovy flock and have learned a whole lot in the garden and where we plan to go with many aspects of our homestead. We decided how we plan to move forward with the building of our forever home, picked a site and are getting ready to start breaking ground this Spring. I feel like I’m all over the place with this post, because so much has happened this year that I hardly know where to start. Well, I guess I’ll start with the style of home we are going to build, like everything else, we are winging it. Below are pictures I found online that inspire us, and capture the style we are going with. It’s called hyperadobe. This way of building is very labor intensive, but wicked cheap, will last forever, is very efficient all year long, and bestest of all, roundy and domey!! Plus it will be like living underground, with out having to dig deep in our rocky slope. Oh how piggy has grown! The chicks are doing great. We’ve lost only 3 so far, and the rest seem to be thriving. The other day Tim started building a grow out pen for the meat chickens, and it’s coming along great. Here is a picture of the inside of the nest, co-zy! 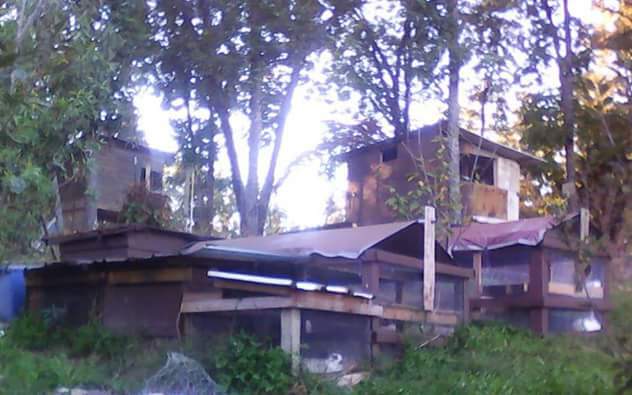 (Update: 2 October 2015) A friend of ours raises meat chickens and got us a super deal on 25 chicks that were just a few hours old (fresh from the incubator)- just couldn’t pass it up, so we built another off grid chick brooder made to house 20 chicks. We brought them home 29 September 2015, and so far so good. They are strong little buggers, and are doing great with out a heat lamp. In the morning we bring them out to the orchard in the warm morning sun and let them out into their run, to play, eat and drink all day. In the evening when the fall temperatures begin to plummet, we shoo them into the enclosed nest box and bring them in the house for the night. Repeating each day. We are amazed at how tough these chicks are, at night in their little nest box we have a thermometer, it stays around 75F all night, and in the morning they are bright eyed and ready to play outside. This experience is inspiring us to make permanently placed brooders out on our south facing slope so we can raise our own layers from chicks starting early spring. We’ll see how this experiment progresses. Here are some pictures of the brooders and our cute little chicks. This one you can see the thermometer, the chicks are staying plenty warm in the sun. TAH-DAA!! Finished the second bigger brooder! YAY! These turned out really nice, we made the first (black) brooder with plywood we had on hand, and the second brooder we made out of an old pallet box. 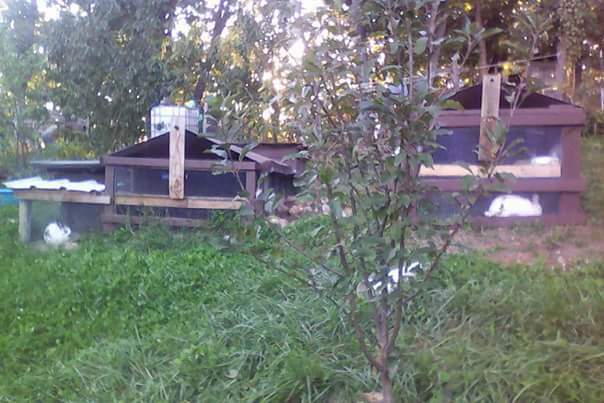 (Posted: 27 September 2015) This is our off grid chick brooder. So we made this brooder with materials handy onsite, it isn’t exactly what is depicted in the pdf above, but close and made with what we had on-hand. We built it out of ply wood, used wire screen for the bottoms, and top of the run box. Made an insulated lid for the nest box, then lined the nest box with pink insulation board, we plan to put hay in the bottom before the chicks go in. Painted the whole thing black to help with heat absorbtion, and also to keep the plywood from rotting too fast. Next we plan to get some little hinges to attach the run lid, and some little latches to keep the nestbox lid from coming off, and also little latches to attach the nestbox itself to the run so it can’t be knocked over by a critter. So this is an experiment, we’ll see how it goes. Wish us luck! Laying Hen Expansion, almost done! Tomorrow we bring home our new (to us) chickens!! This is how far we got today. Tim made and hung the door, I got the front painted, and part of one side. Tim got the coop run fenced in, it needs some final touches before we bring the chickens home, but by tomorrow evening we’ll have doubled our layers! Yeeep! Before we painted or got the chicken fortress coop and run finished. After painting the front, part of the side, and Tim got the fortifying fencing up. We are going to be fencing in a much larger area for the chickens to come out and spend the day in, but at night we lock them in here for their own safety. Update from August 22nd to September 3rd, so much to post about! Following are pictures from as far back as 8/22, lots of farm critter pictures, and then pictures of our family visiting (they arrived the evening of 8/24)! We were spoiled with Grandpa Steve and Grandma Sandi, they drove out their super cozy and new RV and camped in our driveway for 10 whole days! We had a wonderful time with ya’ll, and miss you two so much! The same evening that the grandparents got here, Tim’s brother, Tom and his wife Katie and their two adorable munchkins (Hannah & Tiberius) got here too. Tom and Katie stayed in a motel the first and second night close by so they spent much of the first couple days with us, then they went to explore Ohio and go to Cedar Point. I’m thankful we got to see them, it was so nice to see their faces and get some good hugs, even if the time spent together was so very brief. I felt like we got to really spend quality time with Steve and Sandi, it was so wonderful having them blend in with our daily life, help us with chores and Steve even helped Tim build another awesome spacious rabbit cage, completing our 4 phase grow-out Rabbitat! These are some happy grow out rabbits. They are enjoying getting to play outside, dig in the dirt and crawl through log tunnels. Quality of life for our meat supply, Check! Happy Healthy Rabbits=Happy Healthy Us! Tim also just finished making a bucket watering system for them, of which I’ll get pictures later and post them as well.